Stanley John Fred Bowerman was born in Yeovil in February 1891, the son of butcher Joseph Bowerman (1851-1935) and Annie née Lewis (1861-1933). The 1891 census shows two-month old Stanley living with his parents, a butcher's apprentice and a servant in Wine Street. By 1901 Joseph Bowerman had a shop in Middle Street and he and his family lived above the shop premises. In the 1911 census Joseph and his family were all still living above the shop. Joseph gave his occupation as butcher while Stanley, his mother, two older sisters Elsie and Amy and younger brother Leonard all listed their occupations as butcher's assistants. 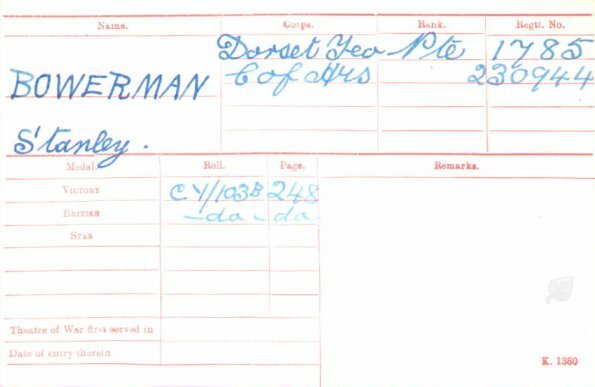 It is not known when Stanley enlisted in the Army, but he is known to have enlisted at Sherborne as a Private in the 1st/1st Queen's Own Dorset Yeomanry, (Service No 230944). 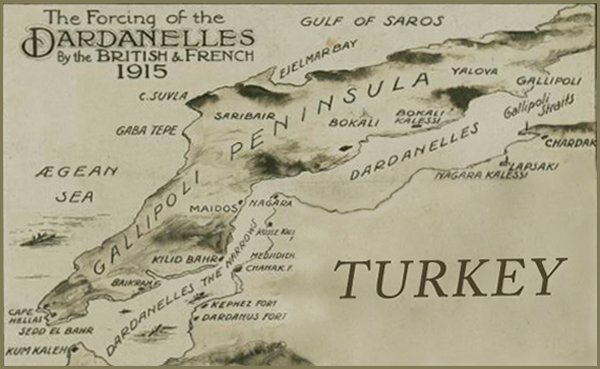 In 1915, they were deployed overseas to Egypt, then moving onwards to participate in the Dardanelles campaign, where they served as dismounted troops and were involved in the Battle of Gallipoli, the Battle of Sari Bair and the Battle of Scimitar Hill. After the evacuation of Gallipoli, they returned to Egypt in January 1916 and became part of the 6th Mounted Brigade an independent brigade that was involved in the Battle of Aqqaqia in February 1916. At this battle, the retreating Senussi were attacked by the Dorset Yeomanry with drawn swords across open ground. Under fire, the Yeomanry lost half their horses, and about a third of their men and officers were casualties (58 of the 184 who took part). In February 1917, 6th Mounted Brigade joined the Imperial Mounted Division and took part in the First (26 March 1917) and Second Battles of Gaza (17 to 19 April 1917). they later transferred to the Yeomanry Mounted Division in June 1917, for the Battle of Beersheba (31 October 1917) and the Third Battle of Gaza (1/2 November 1917). Stanley Bowerman, his unit being part of the Egyptian Expeditionary Force, would have taken part in all these battles with his unit. This was the beginning of the Southern Palestine Offensive that ended with the capture of Palestine by the Allied forces on 9 December 1917. Beersheba was defended by lines of trenches, supported by isolated redoubts on earthworks and hills, which covered all approaches to the town. The Ottoman garrison was eventually encircled by the two infantry and two mounted divisions, as they (and their supporting artillery) launched their attacks. The 60th (London) Division's preliminary attack and capture of the redoubt on Hill 1070, led to the bombardment of the main Ottoman trench line. Then a joint attack by the 60th (London) and 74th (Yeomanry) Divisions captured all their objectives. Having survived these battles, Stanley was killed in subsidiary actions on 13 November 1917. He was 26 years old. 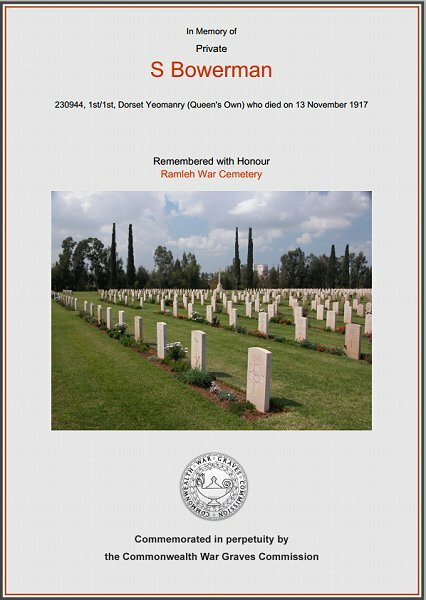 He was buried in the Ramleh War Cemetery, Palestine, and his name is inscribed in the County of Somerset Book of Remembrance in St Martin's Chapel, Wells Cathedral and his name is also recorded on the War Memorial in the Borough. British Army WWI Medal Rolls, record card for Stanley Bowerman, showing his entitlement to the Victory Medal and the War Medal. The Commonwealth War Graves Commission certificate in memory of Stanley Bowerman.